1/30/13 by Julie Wiener- Don’t expect any tired stereotypes of Jewish mothers in “The Purim Superhero,” a children’s picture book just out from Kar-Ben Publishers. Nate, the hero, is a Jewish boy with two dads. The new book — being promoted in a series of parties and events this month — is believed to be the first-ever LGBT-inclusive Jewish children’s book in English. The text, by first-time author Elisabeth Kushner, was the winner in a national book-writing contest sponsored by Keshet (Hebrew for “rainbow”), a national organization that works for the full inclusion and equality of lesbian, gay, bisexual and transgender Jews in all facets of Jewish life. The story revolves around Nate’s desire to dress up as an alien for Purim, even though his Hebrew school classmates tell him all the other boys will be dressing up as superheroes. When he turns to Daddy and Abba for advice, they suggest that being different can sometimes be a good thing. As an example, they point not to their own family, but to the lesson of Purim, which celebrates Queen Esther, a girl whose courage to be true to herself ends up saving her people. 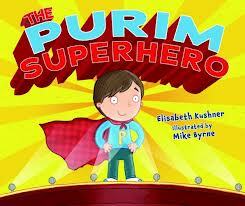 In a Q&A on Keshet’s blog, Kushner, a children’s librarian who worked for nine years at the Jewish Day School of Metropolitan Seattle, said she had been thinking about writing a Purim book for a long time, but had been too busy. However, when she heard about the contest, “I finally stopped and said, ‘I’m a Jewish lesbian mom who was a librarian at a Jewish day school. I know a lot about this stuff, and I’ll feel really silly if I don’t do this.’ So I took a few weeks to work on it, and with the additional element of queer family members, it took shape really quickly, especially since Purim is all about coming out and being who you are.